Download Red Rock Group Use Information and reservation application for events. All areas are available for public use on a first-come, first served basis, when not reserved. Reservations may be made up to six months in advance, except for wedding reservations, which can be made up to 12 months in advance. All reservations require a non-refundable $25.00 reservation fee. Payment must be received at least 30 days in advance to secure the reservation and fees are non-refundable. Vehicle entrance fees still apply. Large covered ramada, which holds 13 picnic tables that can be arranged to suit your needs. Electrical outlets, water, and barbecue grills (charcoal only) are available for use. Bathrooms located nearby. Maximum Group Size: 75 with existing tables and up to 250 with additional tables/chairs (user provided). Facility Use Fee: $100; plus a non-refundable $25.00 reservation fee. Two ramadas located near Twin Cypress area, holds seven picnic tables that can be arranged to suit your needs. Water available for use, bathrooms located nearby. 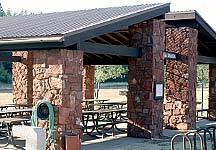 Two ramadas located near the Visitor Center, holds six picnic tables that can be arranged to suit your needs. Electrical outlets are available for use. Visitor Center bathrooms are nearby. Ramada is non-reservable. First-come, first-served.